B.C. 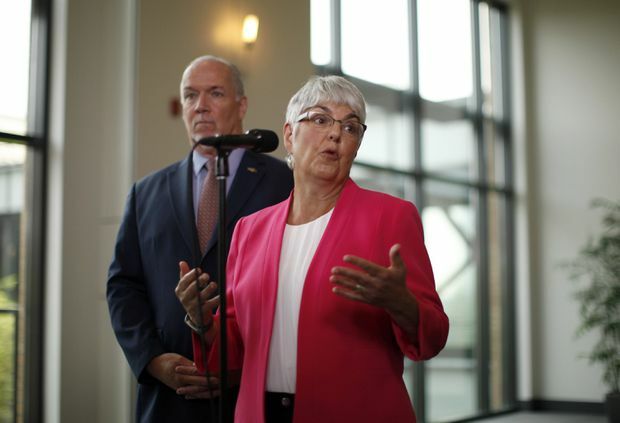 Premier John Horgan looks on as then MLA Carole James answers a question during a media scrum following a meeting with federal ministers at the Vancouver Island Conference Centre during day two of the Liberal cabinet retreat in Nanaimo, B.C., on Aug. 22, 2018. Back in the mid-1990s, cable television companies added a bundle of specialty channels to their lineups. Consumers were automatically charged extra for the channels unless they contacted the cable providers and explicitly asked that they not be included in their service. The tactic incited widespread outrage in Canada and was given a name: negative-option billing. Eventually, the federal government passed a law that banned the practice. We dip back into that history today because British Columbia’s New Democratic Party government has taken a page out of the old cable companies’ billing playbook. And its decision to do so is provoking just as much backlash. The NDP’s speculation and vacancy tax is intended to punish people who own homes that are left mostly vacant all year, including vacation properties. It is among a suite of measures that the government brought in last year to address the province’s housing crisis. The tax targets mostly urban areas and regions where people might have second homes. The government calculates it will only affect 1 per cent of homeowners – or about 32,000 people. The rate for 2019 is 0.5 per cent of the assessed value of all properties. So for a $1-million home in Greater Vancouver that would amount to about $5,000. For foreign owners (who pay most of their taxes in another country) the rate is 2 per cent. But here is the kicker: 1.6 million homeowners will be required to file a declaration that will determine if they have to pay the tax. Anyone who doesn’t apply for the exemption will be declared a speculator and will be hit with the tax. And people will have to make this declaration year after year after year. Without question, this is the stupidest thing that the NDP has done since gaining power. It’s even worse than its terribly bungled effort to bring in a form of proportional representation, a plan that went up in flames because of a deeply flawed rollout. But the speculation tax redefines inept. People shouldn’t have to prove, annually, that they live in their homes year-round. That’s outrageous. More so, is the fact people could be out thousands of dollars if they somehow miss or ignore the letter they receive from the government notifying them of the tax assessment. (Although those who miss the March 31 filing deadline can apply later). But it’s even more complicated than that. If the home is co-owned, for instance, both people need to go online and fill out the necessary documentation. Over all, the NDP has done a commendable job in government. Premier John Horgan and his team have tackled very tough issues that the previous Liberal regime ignored and allowed to become even more intractable. So, the government deserves a lot of credit for the work it has done over two years. But this tax threatens to undo it all. This is a gift the Liberals couldn’t have dreamed of receiving, especially with a critical by-election underway in Nanaimo – a city where the speculation tax applies. Even the New Democrats’ governing partner, the Greens, oppose the tax and call it a disaster. Leader Andrew Weaver has gone out of his way to make clear that his party had nothing to do with the policy, even though it voted in favour of it. Finance Minister Carole James, who is responsible for overseeing this flawed endeavour, has been trying to put the best possible spin on it. She has suggested the forms homeowners will have to fill out aren’t complicated. The government says it should take about 20 minutes to navigate the more than two dozen pages you must go through to finish it. But we all know there are people, certainly many elderly folks who live on their own, who aren’t going to know what’s going on. There will be people who will receive the government letter on the tax and discard it as useless propaganda without taking the time to read it. And they shouldn’t be faulted, or penalized for that. Surely, a responsible government, or at least one that hopes to get re-elected one day, can’t take the attitude that if people are too stupid or too lazy to read their mail or too enfeebled to figure out the exemption process, then they should pay the tax. But that’s effectively what the NDP is saying. I hope the government takes a sober second look at this tax, and the way it’s been designed. Because right now it looks like its architects weren’t thinking straight when they came up with it.